These 24" x 300' 60# Indented Kraft Paper Rolls are soft, absorbent, and made from 100% recycled material that bounces back after repeated impacts during shipping. 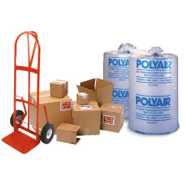 Heavy-duty, non-abrasive protection for fragile items or heavy industrial parts. Indented Kraft Paper Rolls are biodegradable and crumple easily to fill any space.